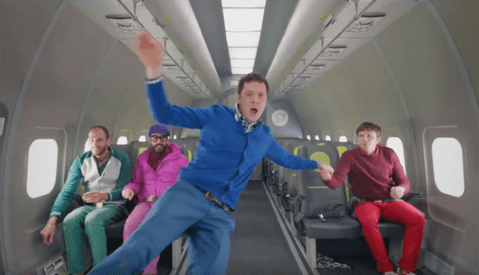 Dancing on treadmills, zero-gravity choreography, laser-beamed toast, and extreme dominoes — this is a list of some of the wonderful and wacky ideas OK Go have turned into music videos. Every one is wonderfully executed, but how do they devise and develop such elaborate and complicated ideas during their creative process? OK Go took to the TED stage a few months back to explain their thought process from start to finish, which you can watch right here at the top of this page. OK Go music video release dates are earmarked not just by music fans, but by creatives the world over. So to get an insight into their idea generation is a real treat. It's fascinating to hear lead singer Damian Kulash discuss their sandbox approach to music video-making. The Upside Down & Inside Out video, for example, came from a "wouldn't a zero gravity video be cool?" comment, which led to a full week and a third of their budget being invested into constant "vomit comet" flights to determine what would work and what wouldn't. The final outcome is seriously impressive. What I love most about OK Go is the way they have recognized the opportunity to create their own platform for their music to be heard using creative, inspiring, and unique video content. And these ideas do not have to cost a million bucks, either. The Here It Goes Again video (with 37 million views) is a wonderful example of low-budget, engaging video content. If you're ever lacking inspiration for your next photography or video project, take a leaf out of the OK Go manual: dedicate some time to test your idea out, no matter how bad you think it is, and see what comes out of the other end. OK? Go.